Posted by Tom Knuppel on Mar 2nd, 2017 in Society | Comments Off on Is Ignorance Really Bliss? We are living in interesting times. That has been stated throughout every generation. The fact is all of them have been right. The world is moving faster today than ever before. The written word and spoken word is seen and heard almost instantaneously if we want it to be. But now we are seeing an influx of people becoming involved in activities that have been stagnant for a long time. These activists have created a new discourse into talking to each other and particularly on how to have a national discussion when people disagree. One of the most common topics in this country is politics and it has become apparent that there is a problem with how we are sharing our ideas with one another. Who we vote for should not define who we are. We should not be judging others for who they are just because they may have views that oppose our own. We live in a country that was built on the idea of being able to have controversy without conflict. The concept of being able to have a rational debate on educated ideas is what America’s structure consists of. Agreeing to disagree peacefully has become a lost art. Aside from all the social media trends and endless blogging that contains no factual information, it is obvious that the majority of people are failing to have the drive to learn new ideas. The thought of having views that are your own and not being able to sustain a conversation with someone with opposing views shows a lack of confidence in what you believe in. If you have beliefs that are supported by facts, then there should be a drive to first, spread your ideas and reasoning, and second, absorb and understand the reasoning behind the views that you are opposing. Personally, I believe that it is a sense of embarrassment that drives this failure to peacefully communicate in our society. People are ashamed of the lack of factual knowledge that they have; therefore, this leads them to becoming hostile when someone tests their ignorance. 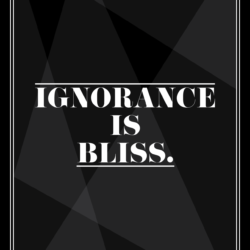 This can also be compared to the saying, “Ignorance is bliss”, which seems to be growing in popularity in the younger generation. But that is another problem of its own. If you want to live in ignorance, that is your right as an American. It is not a right however, if within that desire lies a sense of entitlement for their ignorance. While all Americans are free to follow whoever and whatever ideas they please, they should not discredit all other ideas merely out of ignorance about them. I find it ironic when someone desires to spread ideas but refuses to obtain any new ones. How did that person learn that information in the first place if all they are interested in is people accepting their ideas or convictions? The point here is Americans are residing in a country that is able to contain a world of opposing ideas in one place, under the banner of freedom. We are free to believe in what we want as well as what we do not. We are free to spread and accept all ideas we interact with. We are free to obtain any knowledge we want even if we do not agree with it. We should not allow conflict to have a crippling effect on our awareness. Just my thoughts on that!